To Cite: Abdel Rahim K A A, Ali Mohamed A M. Bactericidal and Antibiotic Synergistic Effect of Nanosilver Against Methicillin-Resistant Staphylococcus aureus, Jundishapur J Microbiol. 2015 ; 8(11):e25867. doi: 10.5812/jjm.25867. Background: Methicillin-Resistant Staphylococcus aureus (MRSA) are bacteria responsible for several difficult-to-treat infections in humans. These strains have developed, through the process of natural selection. Infections by MRSA are more difficult to treat with standard types of antibiotics and thus more dangerous to human health. Objectives: The aim of this study was to evaluate the bactericidal and antibiotic synergistic effect of silver nanoparticles (Ag-NPs) against MRSA. Materials and Methods: Methicillin-Resistant Staphylococcus aureus strains were isolated from clinical samples and identified, and their susceptibility was tested using the MicroScan® WalkAway-96® SI System. minimum inhibitory concentration (MIC) was determined by a microdilution method. Time kill assay was performed by exposing the MRSA isolates to different concentrations of Ag-NPs and monitoring bacterial growth, by measuring optical density at 600 nm. 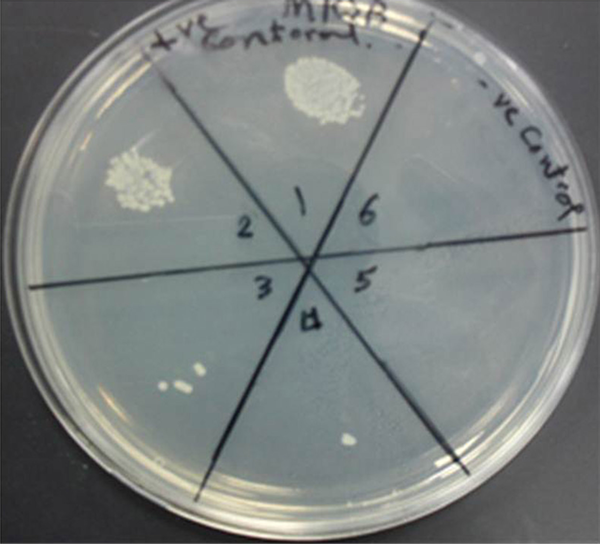 Tissue culture plate was used for determination of the efficacy of Ag-NPs and their combination with antibiotics in the elimination of formed biofilm. Results: The MIC value of Ag-NPs against MRSA was 100 μg/mL. Methicillin-Resistant Staphylococcus aureus cells were treated with 50, 100 and 200 µg/mL of Ag-NPs and inhibited bacterial growth so that after four hours, almost all treated MRSA cells were dead. All combinations showed effectiveness against MRSA. It was observed that MRSA did not show inhibition zones with ampicillin alone. Conclusions: Silver Nanoparticles have high therapeutic activity against MRSA, thus can be suggested as an alternative or adjuvant with antibiotics for MRSA treatment. Further studies are required to understand the synergistic effect of Ag-NPs combinations and to assess the safety and efficacy of new antibiotic-Ag-NPs combinations. Methicillin-Resistant Staphylococcus aureus (MRSA) is a pathogen that has received great medical interest, as it has not been eliminated from healthcare institutions or the environment (1). A bacteremia caused by S. aureus leads to between 25% and 63% mortality; the medical importance of MRSA is due to the high rate of mortality and morbidity associated with its infections and it is considered the main cause of nosocomial infections worldwide (2). The world health organization has reported an MRSA prevalence of about 70% to 80% of all the S. aureus isolates in some Asian countries (3). A total of 92 (26.3%) S. aureus isolates were obtained, of which 33 (35.9%) were MRSA and 27 (29.3%) were Multi-Drug Resistant Staphylococcus aureus (MDRSA) in Iran (4). Currently there is a critical need to find alternative antimicrobials, especially those that could be used for treatment of MRSA infections (5). Amongst several antimicrobial compounds that have been investigated, Ag-NPs showed promising antimicrobial properties, which could be used for treatment MRSA and other drug-resistant infections. Silver Nanoparticles (Ag-NPs) (less than 100 nm) have shown novel antimicrobial activity to a wide range of microorganisms due to their high surface area to volume ratio and their unique chemical and physical properties when compared to the properties of their bulk form (6). These Ag-NPs could be applied safely in therapy when effective concentrations against many types of organisms have been determined. Recently, we demonstrated that Ag-NPs show antifungal activities, including apoptotic cell death. In particular, we showed that hydroxyl radicals play an important role in apoptosis (7). In addition, many researches have investigated the synergistic effect of Ag-NPs when combined with other compounds: a combination of amoxicillin and Ag-NPs showed better antibacterial properties against Escherichia coli than when they were applied alone (8). The production of biofilm is related to antibiotic resistance problems (9). Bacteria strongly adhere to surfaces using a biofilm matrix, 3D, gel-like, highly hydrated and locally charged environment. Adhesion of these bacteria to other organs may contribute to the pathogenesis of infection (10). Biofilms are often associated with dental plaques (11, 12), endocarditis (13), lung infection (14) and infection through medical devices (15, 16). In the present study, we investigated the antimicrobial and anti-biofilm activities of Ag-NPs alone and in combination with conventional antibiotics against pathogenic bacteria. Eighty S. aureus isolates were obtained from clinical specimens at the microbiology laboratory of the Department of Clinical Analysis at the Gynecology and Children Hospital, Hafr Elbatin, KSA. Mid-stream urine, suction tip, pus and blood specimens were collected aseptically for bacteriological examination. Handling, transporting and storing of collected samples were made at refrigeration temperature. All samples were inoculated on blood agar, incubated at 37°C overnight, and colonies were processed. The MicroScan® WalkAway-96® SI System (Siemens Healthcare Diagnostics Inc, USA) was used for laboratory identification, while antimicrobial susceptibility testing and MRSA detection was performed using Neg/BP/Combo 30-B1017-306E® combination panels (Siemens Healthcare Diagnostics Inc, USA). All procedures were performed according to the manufacturer’s instructions. The well-diffusion method was used to evaluate synergistic effects of Ag-NPs with antibiotics. Silver Nanoparticles were obtained from Sigma (St. Louis, MO, USA). Minimum inhibitory concentration (MIC) was defined as the lowest concentration of Ag-NPs preparation that prevented bacterial growth. The MIC was determined using the micro-dilution method; using LB broth (Sigma, St. Louis, MO, USA) MRSA concentration was adjusted to the McFarland standard. The MRSA isolates were exposed to serial twofold dilutions of Ag-NPs, and MRSA viability was measured after 24 hours of incubation. The MRSA cell viability was measured using a colony-forming capacity assay on nutrient agar (17). All the assays were done with a negative and a positive control. To examine the growth curves of MRSA, isolates were incubated in Mueller-Hinton broth (Sigma, St. Louis, MO, USA) with different concentrations of Ag-NPs (0, 50, 100, and 200 μg/ml), and the MRSA cells concentration was adjusted to McFarland standard and cultures were incubated in a shaking incubator at 37°C for 24 hours. Growth curves of MRSA cultures were constructed by measuring of the optical density (OD) at 600 nm at one-hour intervals for seven hours. Where A is ZOI for the antibiotic and B is ZOI for the antibiotic + Ag-NPs (19). All experiments were performed in triplicates, and means were determined. Results were expressed as percentages. Of the eighty S. aureus isolates, 30 were MRSA, Methicillin-Resistant Staphylococcus aureus. The MRSA isolates were exposed to twofold Ag-NPs serial dilutions for 24 hours. Silver Nanoparticles affected MRSA cellular viability in a dose-dependent manner. Cell viability assay was used to determine the bactericidal effect of different concentrations of silver nanoparticles on MRSA. Bacterial cell viability was measured using a colony-forming capacity assay in nutrient agar. 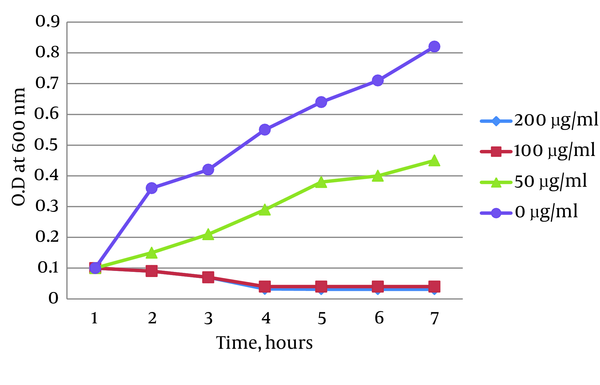 The MRSA isolates were inhibited at concentrations over 100 µg/mL at 105 CFU where no visible bacterial growth was observed in the agar plates Figure 1. 1) Positive control, 2) growth at concentration of 12.5 µg/mL of Ag-NPs,3) growth at 25 µg/mL, 4) growth at concentration of 50 µg/ml, 5) growth at 100 µg/mL, 6) negative control. The MRSA isolates were inhibited at the concentration of 100 µg/mL at 105 CFU where no visible bacterial growth was observed in the agar plates. The synergistic effects of Ag-NPs were investigated with six conventional antibiotics against MRSA, using the well diffusion method and the effects were evaluated by determination of synergism percentage. The results of the combination assay are presented in Figure 3. All of the combinations showed effectiveness against the MRSA. 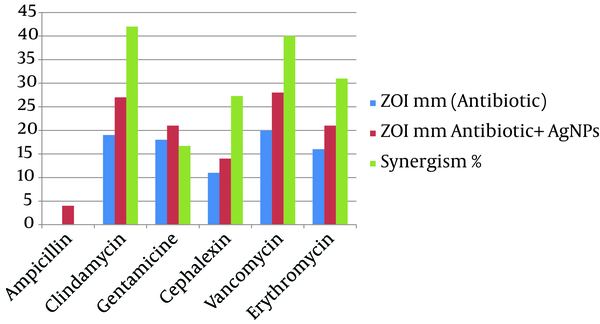 It was observed that MRSA did not show an inhibition zone with ampicillin alone and the highest synergistic effect was observed in the presence of clindamycine Figure 4. 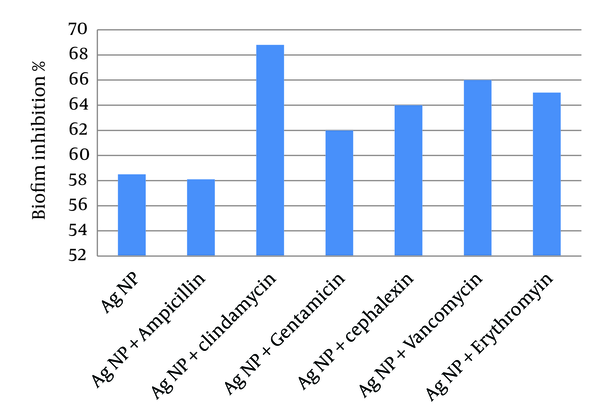 To examine the anti-biofilm activity of Ag-NPs and their combination with antibiotics, MRSA were grown to form biofilms and then exposed to Ag-NPs alone or in combination with the antibiotics (Figure 5). The results showed that Ag-NPs had an inhibitory activity on biofilm formation greater than 55%. Combinations of Ag-NPs and antibiotics, showed a greater inhibitory activity than Ag-NPs alone, yet ampicillin did not show any increase in activity and anti-biofilm activity was due to Ag-NPs. The increased resistance to antibiotics is alarming as treating infections of resistance strains could be problematic. Methicillin-Resistant Staphylococcus aureus are important pathogens with increasing rates of multi-antibiotic resistance due to both intrinsic and acquired mechanisms. This study aimed to examine the antibacterial activity of Ag-NPs against MRSA, using different in vitro assays. To achieve this goal, we challenged thirty clinical isolates classified as MRSA with different concentrations of Ag-NPs and described the effect on MRSA viability, growth rate and biofilm formation. Also we studied the synergistic effect of Ag-NPs with antibiotics to find new formulas of more effective antibiotics to overcome the antibiotic resistance problem. The results showed that the MRSA isolates were fully susceptible to the antibacterial effect of Ag-NPs over the MIC concentration. This proves the results obtained by other authors, which showed colloidal silver is a powerful antibiotic against a wide range of microorganisms at a very low concentration without having any harmful effect on body tissues (22, 23). Small Ag-NPs with large surface areas provide an effective antimicrobial agent even at very low concentrations. Silver Nanoparticles (diameter of 5 - 100 nm) enhances the antibacterial activity of various antibiotics (24, 25). Our results showed a 100% influence by nanosilver at the MIC of 100 µg/mL. These findings indicate that the antibacterial activity of 50 μg/mL of Ag-NPs could slightly inhibit bacterial growth yet not enough to outpace the speed of reproduction of the bacterial cells. Numerous researches have been performed studying the effect of Ag-NPs on pathogenic microorganisms. Our results showed a synergistic effect between nanosilver and antibiotics (Figures 3 and 4). These results are somewhat similar to the results obtained by Fayaz et al. (26) and Rai et al. (27) on Pseudomonas aeruginosa. Interestingly, amongst the selected antibiotics, clindamycin in combination with Ag-NPs showed the highest activity against MRSA (42%), followed by vancomycin (40%) and erythromycin (31%). 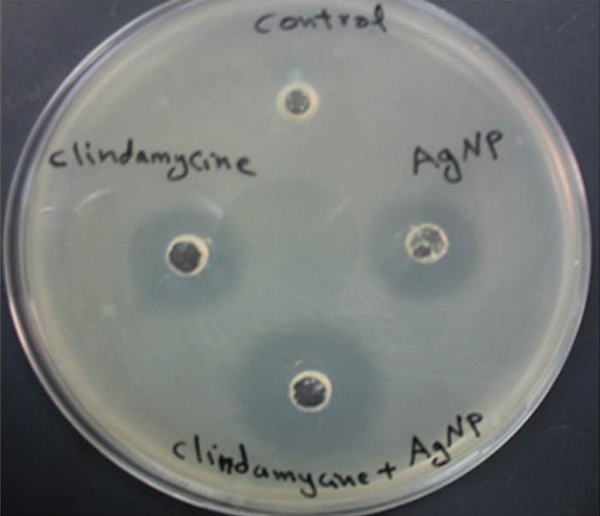 The synergistic effect of Ag-NPs and clindamycin was greater when compared to other antibiotics, which may be due to both, the inhibiting protein synthesis action of the clindamycin and the DNA binding action of the Ag-NPs; similar results were obtained by Shahverdi et al. (28). The probable mechanism involved in the synergistic effect of antibiotics with Ag-NPs could be the formation of complexes between the antibiotics and Ag-NPs; though the bonding of the antibiotic’s active and functional groups like hydroxyl and amino groups to the large surface area of Ag-NPs by chelating (26, 29). Silver Nanoparticles antibacterial mechanism works by inhibiting oxygen metabolism, which finally kills the microbes in a very short time (28). The isolates of MRSA showed zero sensitivity to ampicillin; this effect did not show synergism when combined with Ag-NPs. Generally, the results of the antibiotic-Ag-NPs combination studies reported that Ag-NPs could enhance the antimicrobial activity of some antibiotics. However, many mechanisms of action were suggested for Ag-NPs antimicrobial activity such synergistic effect may not be completely clear (30). Also, the strong antimicrobial effect of Ag-NPs is due to attachment to cell receptors and inhibition of important metabolic enzymes resulting in disruption of microbial cell reproduction and respiration. Our results revealed that the killing rate was not concentration-dependent (31). Long-term cultivation enables bacterial cells to adhere to animal tissues and surfaces (32). This, in turn, results in the biofilm formation, a multilayered community of sessile bacterial cells. Bacteria growing in a biofilm are very problematic in hospitals and healthcare facilities due to their high antimicrobial resistance than planktonic cells. According to the National Institutes of Health, 80% of chronic infections are due to biofilms (33). In this study combinations of Ag-NPs and antibiotics also led to an increase in inhibitory effect on biofilm formation with different degrees, yet, generally showed a greater inhibitory activity than Ag-NPs or antibiotic alone. These are encouraging results, as it may be possible to achieve an effective anti-biofilm effect at lower antibiotic concentrations. Therefore, Ag-NPs and their combination with antibiotics could be used as an anti-biofilm agent against bacterial biofilms. From our study findings, it could be concluded that Ag-NPs have high antibacterial activity against MRSA, and could be an alternative to antibiotics for treatment of drug-resistant microorganisms specially MRSA infection, or enhancement of conventional antibiotics activity against MRSA and other pathogenic microorganisms. Further studies are required to understand the synergistic effect of nanosilver combination, and assess the safety and efficacy of new antibiotic- Ag-NPs combinations. Authors’ Contribution: Ahmed Mohamed Ali Mohamed collected the samples and performed the practical work. Khalid A. Ali Abdel Rahim supervised, wrote and analyzed the data, and submitted this work. Funding/Support: This project was supported by King Saud University, Deanship of Scientific Research, College of Science Research Center.